Reminded of the dark side of the web by all the news lately, we’re all trying to make some sense of it all. Amidst kazillions of conferences, papers, OpEds and what have you, art can offer a more captivating snapshot of the dynamics of net technology, politics and culture. And hold up a mirror to confront you with all the madness, if you like. 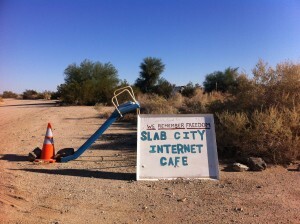 ‘Slab City Internet Cafe’ is a funny and quite accurate installation that captures how many feel about the web today. In politics, and thus in lawmaking, the power of metaphors is enormous. I wrote about the limits of the Big Brother and Panopticon metaphors to describe the current condition of total surveillance, as well as a refreshing encounter between an ethnographer new to ‘the privacy field’ and Mr. Snowden here. And at a major international conference this summer, In.formation In.flux, we’re celebrating the 25th anniversary of my employer, the Institute for Information Law at the University of Amsterdam. I’ve invited Julian Oliver and Danja Vasiliev to keynote about critical engineering and their brilliant art projects. With my friend Joris van Hoboken, I’m also organizing a panel about the metaphors we use to describe our current condition of total surveillance. We’re trying to move beyond ‘Big Brother’ and the ‘Panopticon’ mentioned before, and have invited John McGrath for a talk and a performance. All these projects are worth your time and support, I’ll blog more about them soon. Hey I know this is off topic but I was wondering if you knew of any widgets I could add to my blog that automatically tweet my newest twitter updates.I’ve been looking for a plug-in like this for quite some time and was hoping maybe you would havesome experience with something like this. Please let me know ifyou run into anything. I truly enjoy reading your blog and I look forward to yournew updates. I visited multiple sites but the audio feature for audio songs current at this web site is actually wonderful. and additional data, is there any other website which offers these kinds of data in quality? igyixdklcrb,Hi there, just wanted to say, I liked this article. It was helpful. Keep on posting! djrglhp,If you want a hassle free movies downloading then you must need an app like showbox which may provide best ever user friendly interface. Hi there, simply become alert to your weblog via Google, and located that it is really informative. doeyacbdkf New Yeezy,If you have any struggle to download KineMaster for PC just visit this site. Hi, I believe your web site could be having internet browser compatibility issues. When I look at your website in Safari, it looks fine but when opening in Internet Explorer, it has some overlapping issues. I merely wanted to provide you with a quick heads up! Apart from that, excellent site! hmcerbtcis,If you are going for best contents like I do, just go to see this web page daily because it offers quality contents, thanks! Hi, I do think this is a great site. I stumbledupon it ;) I’m going to come back once again since i have book-marked it. Money and freedom is the greatest way to change, may you be rich and continue to help other people. joddgmce,A very good informative article. I’ve bookmarked your website and will be checking back in future! tyiqeoouwAdidas Yeezy,Definitely believe that which you said. Your favourite justification appeared to be on the net the simplest thing to remember of. somhzzi,This website truly has alll of the information and facts I wanted about this subject and didn?t know who to ask. xtumavet,If you are going for best contents like I do, just go to see this web page daily because it offers quality contents, thanks! mopkggrnxcp,This website truly has alll of the information and facts I wanted about this subject and didn?t know who to ask. hmoiluna Adidas Yeezy,Very informative useful, infect very precise and to the point. I’m a student a Business Education and surfing things on Google and found your website and found it very informative. egpndmezagp,Hi there, just wanted to say, I liked this article. It was helpful. Keep on posting!